In 2014, U.S. Budget Deficit Falls To Pre-Recession Level : The Two-Way As tax revenues increased and spending cuts took effect, the deficit dropped to 2.8 percent of GDP — in dollar terms, the lowest level since 2008. As tax revenues increased and spending cuts took effect, the 2014 budget deficit dropped to the lowest level in six years. -- "The deficit in FY 2014 fell to $483 billion, $197 billion less than the FY 2013 deficit and $165 billion less than forecast in President Obama's FY 2015 Budget." -- As a percentage of GDP, the deficit fell to 2.8 percent, "the lowest level since 2007 and less than the average of the last 40 years." -- In terms of dollars, the 2014 deficit is the lowest it has been since 2008. 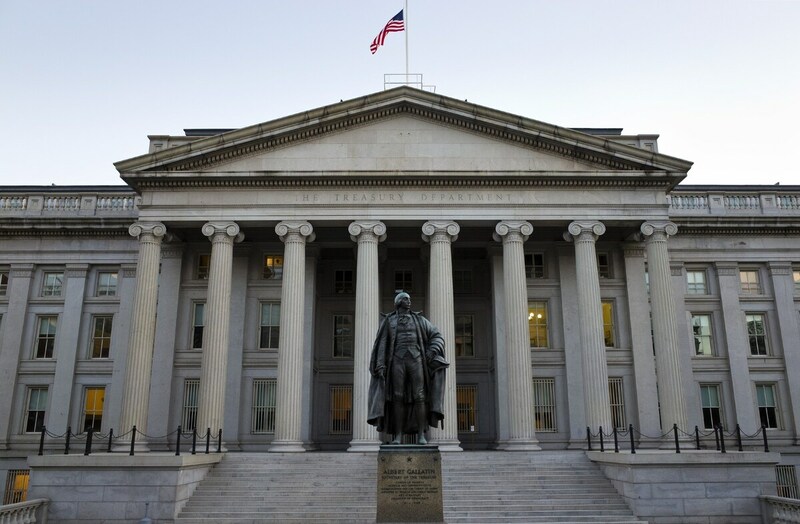 "The President's policies and a strengthening U.S. economy have resulted in a reduction of the U.S. budget deficit of approximately two-thirds — the fastest sustained deficit reduction since World War II," Treasury Secretary Jacob J. Lew said in a statement. "Declining deficits have all but ended the budget fights that preoccupied Mr. Obama and Republicans in Congress from 2011 through 2013. Indeed, the improved picture partly reflects the spending cuts that resulted from compromises between the two sides, as well as higher taxes on wealthy individuals and temporary stimulus measures. "Even so, many economists believe that the immediate spending cuts brought about by the compromises exerted a 'fiscal drag' that slowed the economic recovery and kept pressure on the Federal Reserve to maintain its expansive monetary policies to offset the austerity moves." "'This is not only a reduction of the deficit, it's also a return to fiscal normalcy,' White House budget director Shaun Donovan told journalists. "The economy fell into recession at the end of 2007 and the government's budget deficit ballooned over the next few years. It started narrowing again in 2010, as the economy began to recover. "The deficit as a share of GDP is now below the average for the last 40 years of 3.1%, though that figure is somewhat distorted by the unusually high deficits the government ran during the last recession."